If you want to make art, you have to take care of business. Which, let’s face it, is something most freelance creatives struggle with. If so, you’re in the right place because after fifteen years of perfecting it in my own business, I’ve come up with a system that works. I can tell you—at a glance—how much I made last year and month, which categories the income came from (books, freelancing, courses, etc), and how much I made from each individual client or product. I can also find, within seconds, any article I wrote in the last fifteen years. I can tell you very quickly how many times I followed up with an editor, how many queries I sent and to whom, and which invoices are overdue right this very minute. I can tell you, in about two minutes flat, what my hourly rate was through the year. I can tell you in the same breath what it was for each client. You see, I’m the rare creative with a business head on my artistic shoulders. Tracking things makes me happy. However, if you’re the kind of person who starts hyperventilating just thinking about all this, breathe. Because you’re going to like what I have to say next. I want to give you my system. Fully-created, fully-functional, plug and play. Basically, when you sign up for this workshop, you will get everything you need to get your business up and running in the four hours it will take you to listen to all the material and put it all together. Business in a box, if you will. Take all my systems, set them up once, and you’re done. Then, each year, simply fill in the numbers, and you have everything you could possibly need to show you the health of your business at a glance. In addition to all the Excel sheets, the templates, and the checklists, you’ll have access to 8 half-hour recordings explaining how to set up and use the system as well as how to approach your freelancing and finances in a way that sets you up for success. And listen, I don't want you to just learn this system. I want you to use it. I want you to become an expert at it (which is super easy, I promise). And if you run into any difficulties along the way, I'll jump on the phone with you and personally guide you through the process. That's my promise to you. We’ll talk about why it’s important to treat your freelancing as a business, why you must have a profit motive, and why tracking your income and expenses can set you up for financial success in the long-term. We’ll talk about taxes, the importance of accurate accounting, and how I’m going to make you an accountant’s dream client. I’ll also give you my top strategies for negotiating. Do you want to make more money each year of your business? Then you need to set goals. But not just your average financial and hourly goals. I’m going to share with you my goal-setting strategies (and tracking sheets) that will give every dollar you want to earn a place to go and make you feel constantly motivated to hit your targets. This is where we’ll get into the nitty gritty of my system. I’ll walk you through all my files and show you how to use them so that you can easily enter in a few numbers and get started right away. This isn’t a complicated system by any stretch and my tracking sheets are very intuitive, but here I’ll lay out for you why things are set up the way they are. These sheets include a ledger, a monthly income and expenses sheet, a client sheet, and more. Marketing can be such a headache because of the what sent where when and to whom, right? Let me make it simple for you. I’ll share with you my system for tracking queries as well as my invoicing and follow-up schedule. Again, just enter in the details and you’re done. If you’re anything like me, you’ll be excited about entering in the information the first time and then forget all about ever having set up the system to begin with. We’re not going to let that happen. I have checklists for every event in my business. When I get paid, for instance, I will update my ledger, my monthly income and expenses sheet, then I will update my cash flow statement, and make a note in my goals. I don’t remember all this stuff. I don’t have to. It’s what checklists were invented for. You don’t have to remember either. I’ll do all the thinking. You just follow the steps. This is perhaps the most important part of this workshop. The survival of your business and your dream of being a full-time writer depends on you having cash when you need it. That does not happen by accident. If you want to thrive as a freelancer, you need to keep an eye on your cash flow and consistently find ways to improve it. I’ll share with you my incredible cash flow sheet that pretty much saved my business a few years ago and how to use it to have the same impact on yours. I know a bit about financial emergencies, both in business and in life, and I’m sure you do, too. We can’t talk about money without having a discussion about these emergencies and how to scrape your way out of them. I came upon a strategy to use in emergencies that I have been implementing till this day. It’s called “Closest to Cash.” I’ll explain. Finally, I’m a firm believer that a creative business is never separate from the life of its creator and therefore, for your business to be in good, solid financial health, you have to be in good, solid financial health in your personal finances as well. In this recording, I’ll lay out the plan that my husband and I have followed in terms of funding both long-term and short-term goals when money from freelancing is intermittant. I’ll also share with you the steps to follow to set yourself up for financial success, both in business and in life. If you like talking about money, you’ll love this workshop. If you don’t, you need it. 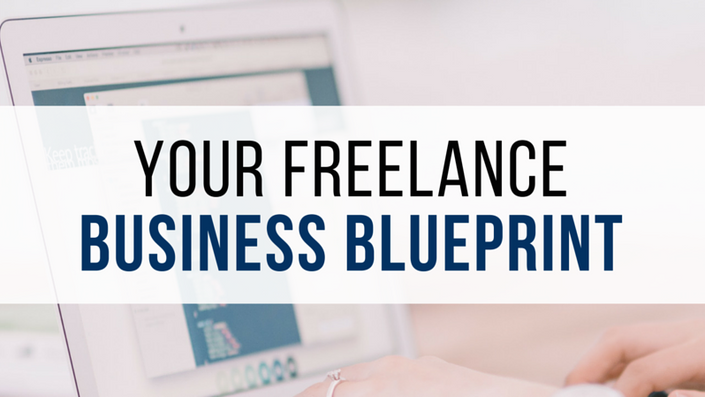 It’s the business of freelancing, simplified.